But don’t take our word for it, Saxelby Cheesemongers wants you to experience it for yourself! With our next Day A-Whey, you could help make some of that most tasty and delectable cheese with your very own hands. Yes it’s true, this June we’re taking a whole dang weekend a-whey to Consider Bardwell Farm, and we want you to be a part of it! Here’s all the cheesy details in a nutshell… we’ll depart on Friday the 20th of June, and stay the weekend at the historic Dorset Inn. We’ll romp and frolick around the farm on Saturday and Sunday, making cheese, bonding with the goats, and helping out in the cheese caves. Saturday night we’ll be treated to a delicious local harvest dinner featuring a cheese tasting with Peter Dixon, cheese maker/dairy guru at Consider Bardwell. Finally, we’ll (begrudgingly) return to the city the evening of Sunday, June 22nd. The trip will depart from Saxelby Cheesemongers mid-afternoon on Friday June 20th. We’ll drive up to Vermont, and land at the historic Dorset Inn in time for dinner and a little walk around town. Saturday morning, we’ll drive over to Consider Bardwell Farm, a 300-acre parcel that just happens to be the site of the first cheese making cooperative in the great Green State. Peter Dixon, resident fromager extraordinaire, will teach a hands-on cheese making workshop, showing us how farmstead goat and cows’ milk cheese is crafted. We’ll get our hands in the cheese vat, and witness the magical alchemy of cheese making from goats in the milking parlor to curds and whey, to a freshly pressed wheel of cheese! serve up a picnic lunch and farm tour, detailing the history of the land and the cheese making tradition there. 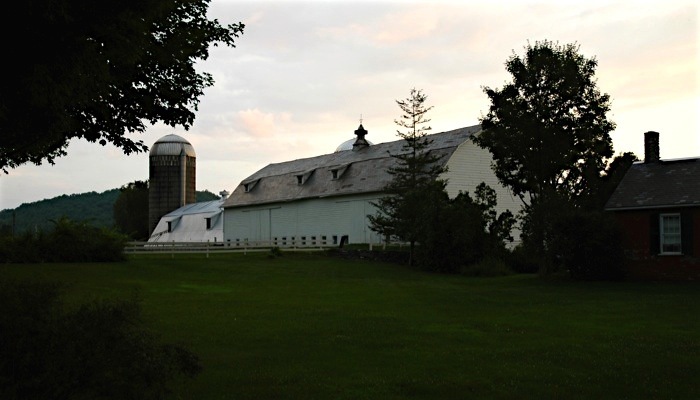 Ms. Miller will also explain how she (a literary agent from NYC) and her husband Russell (an architect) transformed Consider Bardwell from a defunct dairy to a working, cheese-producing farm. Saturday evening, after a full day of farming we’ll retire to the Dorset Inn for a four-course dinner featuring a cornucopia of Vermont-grown produce, meats, and cheeses. A member of the Vermont Fresh Network, the Dorset Inn has been supporting local farms since the 1980’s. For the cheese course, Peter Dixon will lead a guided tasting, showcasing Consider Bardwell’s wonderful array of goat and cows’ milk cheeses. To say that Mr. Dixon knows his stuff would be an understatement… he’s spent the better part of his life making cheese in locales near and far, and crafts some of the best fermented food these mongers have ever tasted. Come Sunday we’ll drive back out to the farm for the final stages of the cheese making process, and have an opportunity to observe and/or participate in the myraid of events that happen in the day to day operation of the farm. In late June, there will be no shortage of activity at Consider Bardwell: the kid goats will be getting into plenty of mischeif, the morning and afternoon milking can be observed, and the mysteries of the cheese aging process will be illuminated as we help with the duties associated with the art of affinage: turning, washing, and caring for the cheese in Consider Bardwell’s cave. After a little picnic lunch, we’ll get back on the road, and will arrive back in Manhattan by Sunday evening. Tickets are $750 for a double (shared) room and $900 for a single room. The cost of the ticket includes transportation, two nights at the Dorset Inn, four-course dinner on Saturday night, catered breakfast and picnic lunch on Saturday and Sunday, as well as the cheese making workshop and farm tour. Pariticipants will be responsible dinner in Dorset on Friday evening. Saxelby Cheesemongers will make special arrangements at a discounted price for guests wishing to provide their own transportation. Space is extremely limited. Reservations will be accepted on a first come, first serve basis. To make a reservation, please call Saxelby Cheesemongers at 212-228-8204.